Noel Schulz has been named the Edmund O. Schweitzer III Chair in Power Apparatus and Systems at Washington State University’s School of Electrical Engineering and Computer Science. The endowed chair supports WSU’s teaching and research in the fundamentals of power engineering, including electromagnetics, controls, communication theory, high voltage materials and practice, and was established thanks to gifts from Edmund and Beatriz Schweitzer, and the employee owners of Pullman‑based Schweitzer Engineering Laboratories. “At SEL, we like to say the best way to predict the future is to invent it,” said SEL President Edmund O. Schweitzer, III. Prior to arriving at WSU, Schulz was the associate dean for research and graduate programs in the College of Engineering at Kansas State University. She also directed the KSU Engineering Experimental Station and the Electrical Power Affiliates Program and was the Paslay Professor of Electrical and Computer Engineering. 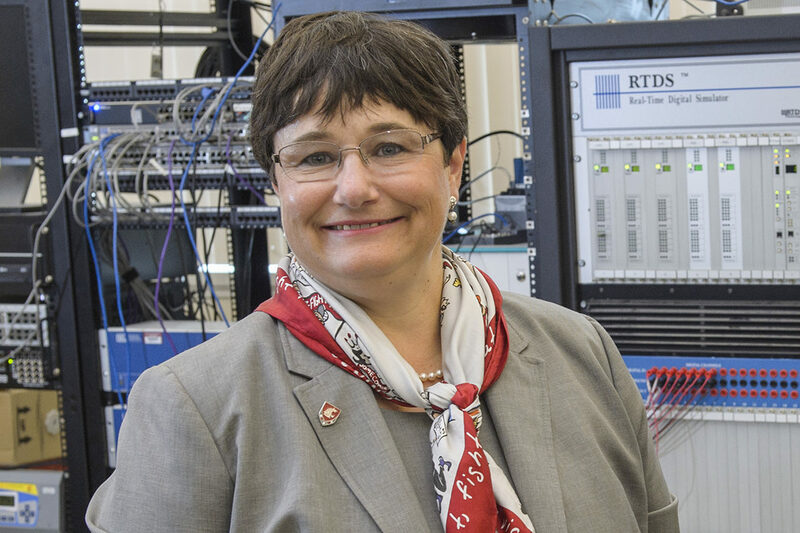 A nationally recognized expert in power systems engineering, Schulz is dedicated to recruiting and retaining women in the field of engineering and mentoring female engineering faculty. Schulz has more than 26 years of teaching experience at Kansas State, Michigan Technological University, Mississippi State University, University of North Dakota, and Virginia Tech. She has taught courses in power systems, energy conversion, application of computer programs to power engineering, application of intelligent systems to engineering problems, fundamentals of electrical circuits, renewable and distributed generation, and smart grid technologies. She received bachelor’s and master’s degrees in electrical engineering from Virginia Tech. She earned a Ph.D. in electrical engineering from the University of Minnesota‑Twin Cities in 1995. And, she has published 175 papers and two book chapters. Thanks in part to the support and advocacy of the Schweitzers and SEL, Voiland College’s School of Electrical Engineering and Computer Science has experienced dramatic growth. Annual research expenditures in the school have more than doubled in the past six years, to $7.6 million annually, with about $4 million of that increase in power engineering research. Enrollment in the school has also doubled to more than 1,000 undergraduates and nearly 200 graduates each year. During the past two years, SEL has hired more than 10 percent of the school’s graduates, more than any other employer. To date, the Schweitzers and SEL have collectively contributed more than $3.6 million to support students, teaching and research across the university.